The Govs had a tough start to the game, with their first field goal coming at the 3:50 mark from Arielle Gonzalez-Varner. 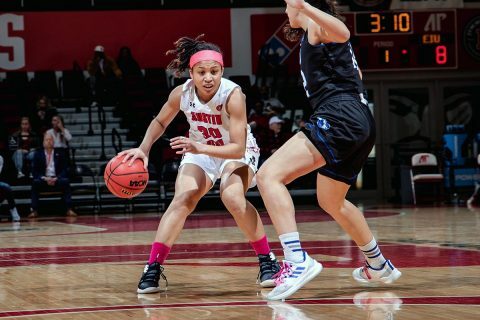 Grace McRae, who did not play in the first meeting, proved to be a huge gain for the Panthers (10-13, 4-8 OVC), as she scored six points in the quarter, as EIU used two 6-0 runs to propel themselves to a 14-8 lead after the first period. The second period started out with more promise, as Maggie Knowles hit a three-pointer on the first possession of the quarter, but the Govs missed their next six shots after. The Panthers took advantage and went on a 7-0 run, with Abby Wahl nailing a triple to put them up 10. However, the Panthers could not extend it much further, as they only made one of their next nine shots. A Keisha Gregory and-one cut the lead to five, but the Govs would not score the rest of the half. The Panthers went on another 7-0 run, as Taylor Steele made a buzzer-beating three-pointer to give them a 28-16 lead at the half. The Govs did a good job limiting EIU’s two leading scorers, Steele and Karle Pace, in the first half, as they only had four combined points, but Wahl and McRae had 15 points between them. Overall, it was a half to forget for the Govs, as they only made two field goals in each quarter in the first half and had their lowest point total in any half this season. The Govs came out with some renewed energy, as Nieja Crawford nailed a long jumper off a nice assist from Gregory. However, once again the Panthers responded, with a McRae three giving them a 13-point lead, the largest of the day. Carmen Tellez, who had been quiet all game, erupted with two long threes in period, putting the Panthers up 16 after each shot. The Panthers had their second quarter shooting 50 percent and used a five-of-seven stretch to lead by 14, 47-33, after the quarter. Both teams traded buckets to start the fourth quarter, but the Govs could not go on a run, especially after Grace Lennox, a preseason All-OVC pick, converted an and-one to put EIU up 14. Jalisha Smith also had a massive half for the Panthers, scoring 11 of her 13 points in the second half while adding five second-half boards. It looked like the Panthers were going to come away with a comfortable victory, but the Govs made it interesting. Gabby Gregory made a three-pointer to cut it to 13 before Keisha made a pair of free throws. The Govs stole the ball on the EIU side of the court that led to another Gabby three and the lead was only eight. The Dunn Center crowds erupted after Knowles made her second triple of the game to cut the lead to just five, but the Govs were a little too ambitious on the press, as McRae was left all alone on the other end of the floor, killing the momentum. From there, the Panthers knocked down free throws to seal the win. After just attempting three free throws in the first half, EIU had 16 in the fourth quarter, making 12 of them. The Govs fall to 6-6 in OVC play and suffer only their defeat at home. Gabby Gregory finished with 11 points, the highest for the Govs. It is the second time in her career she has led the Govs in scoring. Arielle Gonzalez-Varner was just two rebounds away from her second double-double, finishing with 10 points and eight rebounds. The Govs had their second lowest three-point shooting percentage of the season (18 percent). After missing the first meeting, EIU’s Grace McRae led all scorers with 16 points and tied Gonzalez-Varner in the game in rebounds with eight. The APSU Govs are back in action, traveling to Morehead State next Thursday, February 14th.